Growth and development and drifting patterns of teeth are closely interdependent. The primary dentition plays a very important role in the child's growth and development, not only in terms of speech, chewing, appearance, and prevention of deleterious oral habits but also in the guidance and eruption of permanent teeth. It is generally accepted that the premature loss of deciduous teeth is associated with the malocclusion of permanent dentition. The premature loss of primary teeth may reduce the arch length required for the succeeding tooth, and hence predisposes crowding, rotation, and impaction of the permanent teeth. Management of space problems associated with the transitional stages from primary to permanent dentition is a routine component of pedodontic practice. The present study was idealized to evaluate the prevalence of premature loss of primary teeth on arch dimensions in 6- to 10-year-old schoolchildren in Khammam town, Telangana state, India. The present study was conducted in the Department of Pedodontics and Preventive Dentistry, Mamata Dental College and Hospital, Khammam, Telangana, India. The study was approved by Ethical Review Committee and Institutional Review Board. 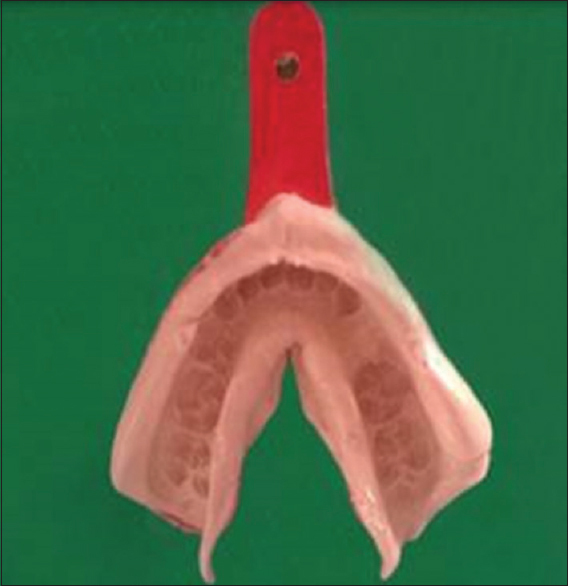 The present study was conducted to assess the prevalence of premature loss of primary teeth on arch dimensions. Before the study, a letter of permission to examine the schoolchildren was given to the head of the schools and permission was obtained. Written informed consent was obtained from the parents or guardians of children. Children with systemic disease and uncooperative behavior were excluded from the study. The study population included 1200 (600 boys and 600 girls) schoolchildren at an age of 6–10 years in Khammam town, Telangana state, India. The examinations were carried out in the participants' own surroundings, that is, the school. The ADA type III clinical examination was carried out during the survey by a trained dentist. An organizing clerk at the examination site maintained a constant flow of participants to the examiner, and the survey with all related descriptive data was filled by a trained dentist. Premature loss was classified according to the chronological table of the permanent teeth eruption as proposed by Kronfeld and decreasing 12 months as proposed by Cardoso et al. Intraoral photographs of missing teeth [Figure 1] and [Figure 2], alginate impressions of the study population with the missing teeth [Figure 3] and [Figure 4], and diagnostic casts were prepared [Figure 5]. All the data were subjected to statistical analysis. Microsoft Excel/2000 (Microsoft Office XP) data spreadsheet was used and later exported to the Statistical Package for Social Science (SPSS) for Windows (version 10.0). Descriptive statistics were applied, and from the results, Chi-square tests were applied at a level of statistical significance of 5% (P < 0.05). Figure 1: Intraoral photographs of teeth in maxillary arch. Figure 2: Intraoral photographs of teeth in mandibular arch. Figure 3: Alginate impressions of the study population with the missing Teeth in maxillary arch. 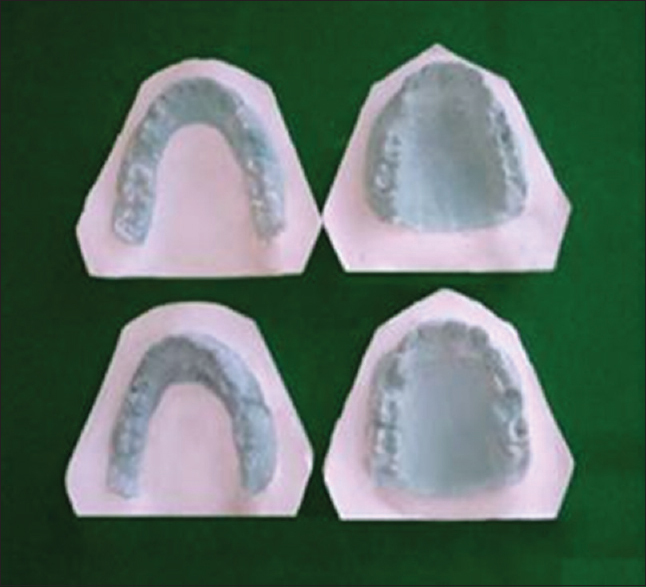 Figure 4: Alginate impressions of the study population with the missing Teeth in mandibular arch. In this present study, 1200 schoolchildren were screened, the prevalence of premature loss of primary teeth was found in 162 children (13.5%) and male children (57.89%) had a higher prevalence of premature loss when compared with the females (42.10%) [Table 1]. The tooth with the highest loss of prevalence was 84 (mandibular right first primary molar) with 22.7% of the total, followed by 54 (maxillary right first molar) with 15.8% of the cases [Table 2]. According to the distribution of dental arches, more number of teeth were lost in the mandibular arch (50.6%) when compared with the maxillary arch (38.2%) [Table 3]. Precocious loss of primary teeth was higher in the right side of the dental arch (39.5%) when compared with the left side of the arch (28.39%) [Table 4]. The increased prevalence of caries in boys compared to girls confirms the view that there is a marked preference for sons regardless of the socioeconomic class, which manifests itself in the longer feeding of sons compared to daughters. When the dental caries pattern was analyzed, caries in posterior teeth surpassed the anterior. In the present study, largest percentage of premature loss occurred in the age of 8 years, followed by 7 and 9 years. The tooth most commonly affected by early loss was 84 (lower right first primary molar), with 62 (22.7%) teeth lost. These findings of the present study were similar to the study done by Leite-Cavalcanti et al. and Ahmed et al., This could be attributed to the fact that primary molars may be particularly critical for initial mutans streptococci colonization because they emerge into the oral cavity between 16 and 29 months of age and possess both fissured occlusal surfaces “window of infectivity.” Another possible explanation could be morphological variation of posterior teeth, accessibility of brush and dexterity of brushing, increased consumption of sweets, and genetic pattern. In the present study, there is greater prevalence of premature loss of first molars when compared with the second molars, which was similar to the findings of Almoundi. The probable reason for this might be due to the difference in the chronological age between the first and second primary molars, where the first primary molar erupted before the second primary molar; and therefore, it had been present in the oral environment for a longer period than the second primary molar. It also might be from a clinical point of view; while many clinicians would endeavor to restore a grossly carious second primary molar to maintain space, especially before the eruption of the first permanent molars, the first primary molars were usually extracted in such cases as the success rate of endodontics, which was alternative treatment, was considerably lower. In the present study, a greater loss of primary molars was observed in the mandibular arch followed by maxillary arch. These findings were similar to that of Leite-Cavalcanti et al. and Ahmad et al., This might be due to food packing potential and greater plaque accumulation in the mandibular posterior region in contrast to the relative abundance of saliva and its anticarious effect to maxillary posterior teeth. When prevalence of premature loss was observed according to the sides of arch, in this present study, the children had more number of teeth loss in the right side of the jaw when compared with the left side. These findings were in accordance to Ahmad et al. and Alamoudi et al., This could be attributed to the possibility of greater attention being paid to the right sides of both jaws during oral prophylactic procedures and masticatory processes. The tendency for higher deposition of plaque on those teeth in the less frequently cleaned and used sides of the jaws might be due to lack of shearing occlusal and tooth brushing forces, which were very important in the mechanical removal of plaque. In the present study, majority of the teeth were extracted due to dental caries followed by the reason of trauma. These findings were in agreement with the study conducted by Mukhopadhyay and Roy who observed that caries was the principal cause of extraction for all age groups, accounting for nearly 60% of primary tooth mortality in children. The unilateral extraction of lower first primary molar in the mixed dentition period among the children in the age group of 6–9 years, who reported for extraction of lower first primary molar, may result in space loss in the extraction side than in the control side. The early space change of the mandibular dental arch after premature loss of the mandibular primary first molar is mostly by distal movement of the primary cuspid toward the extraction space. There is significant space change during the average 8 months of experimental period. The greatest space loss is observed in the first 4 months after the premature extraction. On the contrary, Seward stated that there was no relationship between particular tooth or teeth extracted and either the amount or the rate of space loss. In addition to the mesial migration of the upper molar teeth to reduce extraction spaces due the eruptive force of first permanent molar, they even receive mesial force from the buccinator muscle which extends distally to the last erupted molar tooth which passes completely around to reach the pterygomandibular ligament which is actually lingual to the maxillary arch but not to the mandibular. Therefore, the mesial component thrust of the buccinators is greater on the last maxillary molar than on the last mandibular molar. On the basis of these findings, one of the important services that a pedodontist can render to a pediatric patient is that of maintaining the arch length before the eruption of the succeeding permanent tooth. Hence, the main target in our study was the prevention of loss of primary molars during childhood years to preserve the space for the permanent successors. Majority of the children had loss of single tooth only, and dental caries was the main reason for early loss of primary teeth followed by trauma. Setia V, Pandit IK, Srivastava N, Gugnani N, Sekhon HK. Space maintainers in dentistry: Past to present. J Clin Diagn Res 2013;7:2402-5. Leite-Cavalcanti A, Menezes SA, Granville-Garcia AF, CorreiaFontes LB. 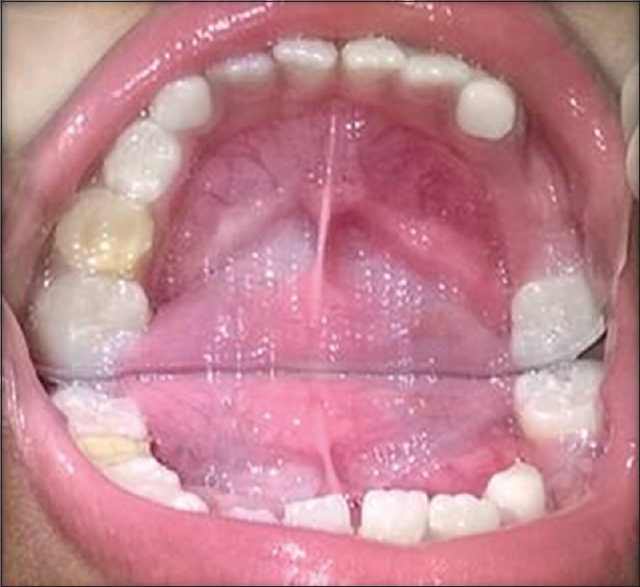 Prevalence of early loss of primary molars in school children in Campinagrande, Brazil. Pak Oral Dent J 2008;28:113-5. Foster TD, Hamilton MC. Occlusion in primary dentitions. Br Dent J 1960;126:76-9. McDonald RE, Avery DR, Dean JA. Eruption of teeth: Local, systemic and congenital factors that influence the process. Dent Child Adolesc 2005;8:174-202. Saloom HF. Early loss of deciduous teeth and occlusion. Iraqi Orthod J 2005;1:36-9. Nazhat NY, Sainarrai SK. Effect of early loss of second deciduous molar on the eruption time of first permanent molar. Jord Dent J 1994;9:7-11. Durward CS. Space maintenance in the primary and mixed dentition. Ann R Australas Coll Dent Surg 2000;15:203. Yonezu T, Machida Y. Occlusal migration of the maxillary first primary molars subsequent to the loss of antagonists. Bull Tokyo Dent Coll 1997;38:201-6. Franscisco J, Ramos G, Gravay F, Cluadia MM, Ramond LB. Infant caries-prevalence and treatment cost of infant caries in Northern California. J Dent Child 1996;63:108-12. Al-Ghanim NA, Wyne AA, Adenubi JO, Khan NB. Caries prediction model in preschool children in Riyadh, Saudi Arabia. IJPD 1998;8:115-22. Saravanan S, Kalyani V, Vijayarani MP, Jayakodi P, Felix J, Arunmozhi P, et al. Caries prevalence and treatment needs of rural school children in Chidambaram Taluk, Tamil Nadu, South India. Indian J Dent Res 2008;19:186-90. Ahamed SS, Reddy VN, Krishnakumar R, Mohan MG, Sugumaran DK, Rao AP, et al. Prevalence of early loss of primary teeth in 5-10-year-old school children in Chidambaram town. Contemp Clin Dent 2012;3:27-30. Alamoudi N, Salako N, Masoud I. Prevalence and distribution of caries in the primary dentition in a Cosmopolitan Saudi Population. Saudi Dent J 1995;7:23-8. 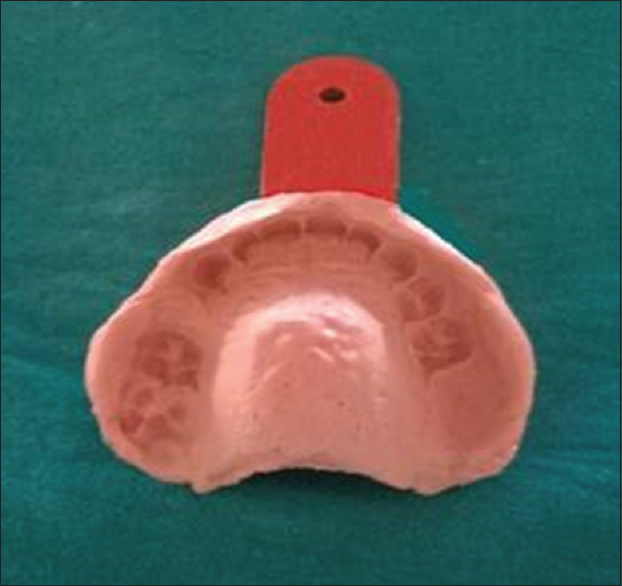 Mukhopadhyay S, Roy P. Extraction of primary teeth in children: An observational study. J Cranio Maxillary Diseases 2015;4:57-61. Seward FS. Natural closure of deciduous molar extraction spaces. Angle Orthod 1965;35:85-94.